1. Cook the rice following pack instructions a few mins before it’s done, add the soya beans. Drain and cool under cold running water. 2. Put the salmon on a plate, then microwave on High for 3 mins or until cooked through. Allow to cool slightly, remove the skin with a fork, then flake. 3. 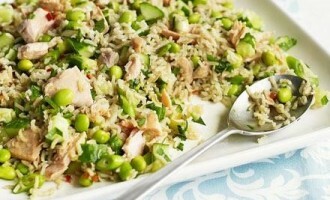 Mix the cucumber, spring onions, coriander and salmon into the rice and beans. In a separate bowl, mix the lime zest and juice, chilli and soy, then pour over the rice before serving.